Harlee lived the good life; for two years her world revolved around her small family including a small toddler, with hours spent luxuriating on the sofa, snuggling with her peeps (she really loves a good cuddle) in spite of her impressive, muscular build, she’s a big softy with the heart of a true companion beating strong and hopeful in her chest. When travelling, Harlee would ride shotgun, right up front, all the better to monitor traffic and oversea her owners driving skills. She’s learned a multitude of commands – she loves the beach and swimming, and is a big boisterous girl, ready to play. 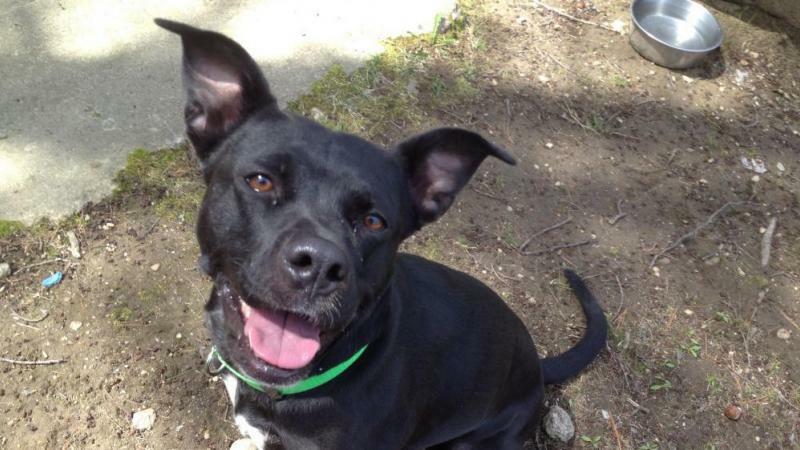 Sadly, Harlee has been living at New Hampshire Humane Society since APRIL. Those of us in the shelter field know the reasons a)she isn’t a cute fuzzy puppy b) her beautiful face is obscured by her coat colour many have simply walked on by, they just aren’t that in to her. Harlee dismayed and rejected feels that acute pain and sorrow of being unwanted. She craves and begs the adopting public to please just give her a chance. We know she is a loyal, sweet girl, who richly deserves the love of a new family. We’ve promised her that day will surely come. Please visit Harlee, her boundless joie de vivre (energy for life) will endear you and win Your heart! Best home: one with energetic humans and no cats.